Pisang Peak is located in the northern part of Nepal in Manang district. 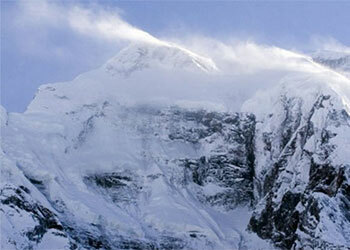 It lies in between Annapurna I and Manaslu. Pisang Peak (6091m) is the most popular climbing Peak among the trekking peaks in the Annapurna region as it is famous for the easy climbing peak. Pisang Peak rises from yak pastures above the village of Pisang in a uniform slope to the final summit pyramid which is an undistinguished snow and ice slope. Pisang peak climbing is well combined with the famous Annapurna circuit trek to make a very satisfying Himalayan trek and climbing adventure in a single trip. Pisang peak provides its climbers an exciting journey passing along varied ecosystems, diverse cultures, and incredible landscapes. Although this climb is considered to be among the easier ones of the Himalayan region, a reasonably high level of physical fitness and health is still strongly recommended. Pisang peak climbing offers a great variety of beautiful landscapes, nature & culture of the central Himalayan beginning from Besi Shahar (823m) with challenging and magnificent scenery. The route encircles the Annapurna Range, the collection of huge ever snow-capped range, reward for your questionable sanity, a breathtaking view of the world’s tallest mountains glowing in the pastel light of dawn and dusk. A steep walk via subtropical forest and small hamlets take to Bahundanda, Chamje and Bagarchhap entering the Manang region with the view of first Tibetan Monastery and the occasional glimpses of Annapurna II (7937m) and Lamjung Himal (6986m). The trail follows through the river valley with good eye-catching sites along the way of Pisang peak and Annapurna II at Pisang village. Enjoy the fantastic climbing of Pisang peak camping at base camp; we conquer the summit. From Manang, we will go to the central valley to the west of the Khangsar Village which is regarded as the Last Village of Nepal and trek up to Tilicho Lake. For the lovers of nature it a magnificent view and real opportunity to see a lake at this altitude and also it is famous for the religious point of view. The trail goes to Yak Kharka and joins the usual route crossing the Thorong La Pass (5416m). Also, we will visit Muktinath via Plateau of Kagbeni and return to Jomsom. On the way, we will pass through every type of vegetation zone from lush sub-tropical to harsh semi-desert, and over one of the highest trekking passes in the world. This magnificent Pisang peak Climbing leads you to the fine village inhabited by a wide diversity of people from different ethnic groups, offering spectacular and majestic views of the white Himalayas. Pisang peak climbing will be a perfect adventure for those who aspire to venture into some of the less trodden remote regions of Nepal apart from regular trekking routes and have an adventurous climbing experience. Very warm ‘Namaste’ (welcome in Nepali) for your great journey with us. We will meet at the Kathmandu, Tribhuvan International Airport and would drive to your hotel. As you get ease and freshen up after your long fight, we humbly request you to visit at our office for a briefing about your program. You will have meeting with your trekking guide and discuss about the equipment needed for the trekking and we will process for the trekking permits. If you arrive at night we will have same discussion in next day morning after your breakfast. The next morning after breakfast you will leave for a full day sightseeing tour around the Kathmandu valley. You can pay your homage visiting center of pilgrimage Pashupatinath Temple (for Hindus) and Swyambhunath (for Buddhists). These are very ancient and historical pride of Nepal importantly enlisted in UNESCO World Heritage sites. The biggest Buddhist Stupa at Boudhnath and the fine arts and historical architecture of Kathmandu Durbar Square reflects the uniqueness and diversity in Nepalese culture. On journey back to hotel, you can travel around the local areas, gullies and lifestyle. You can perhaps take relaxed walk through the famous streets. Take a vehicle or tourist bus to Besi Sahar, about 6 hours drive. Passing through many small villages on the way will fascinate you with snippets of every day living in these lowland villages. If you reach Besi Sahar at lunch time, it’s possible to take a bus or hike along the road to Bhulbule same day. From Besi Sahar we will see some of mountain peaks, natural sceneries surrounding the valley and the daily activities of local people. Beyond Bhulule, the trail travels up the east bank of the river, past an impressive 60m waterfall that is surrounded by a tropical tree called a pandanus or screw pine. Watch the Langur monkeys playing in the treetops. The path wanders through extensive views of Mt. Manaslu and Ngadi Chuli. Cross the Sisneri khola and pass the unfinished base of a long-promised power plant to reach a tibtean settlement. A steep walk via subtropical forest and small hamlets takes to Bahundanda, an attractive village in the saddle of a long ridge. There’s a long, peasant and mostly level walk in forests. The pine-scented trail rounds a bend to reveal the first views of dramatic Paungda Danda rock face, a tremendous curve slab of rock. The trail follows through the river valley with good views along the way of Pisang peak and Annapurna II at Pisang. Crossing the river to its left bank you reach your lodge at the village of Pisang. Pisang marks the beginning of the region upper portion of the Manang district. Today you will have a rest day here. Check and set up all the gears for climbing and acclimatized. Enjoy the whole day with very nice magnificent views of all the Annapurna, Gangapurna and Tilicho. Day 10: - Trek to Pisang Peak Base Camp (4,380m) 4 hrs. Today we start walking up towards Base camp after a day relaxes in Upper Pisang at 3700m. From Upper Pisang village, the path ascends through sparse wood and pasture to a Kharka at (4,380m) which is considered the best place for setting up the base camp. It is in a flat alpine section along the well worn trail. We fix our camp site here. Today we walked for 4 -5 hours and set up our high camp at the height of 5400m after climbing to a shoulder on the south west ridge. It is likely to have snow at high camp from end of Nov till end March. Overnight at tented camp. Today is the final day or the day most important in our journey. Today is a day to fulfill your dream of Summit on Pisang Peak. From the High Camp, the well defined ridge leads to the final snow slop which is quite steep and more technical to reach the summit. After a Successful summit, return back to Base camp to Upper Pisang for overnight. It’s about 6-7 hours trail. From upper Pisang the high trail enters pine grooves to reveal views of the small turquoise lake. The trail does a dogleg through the charming village, passing with views of painted Mandalas and dragon mouth spouts. Hike through the fields of grazing yak and wide variety of crops. This large Tibetan settlement provides good views of Annapurna II/III/IV, Gangapurna and Tarkekang. Stay at 3570m. From Letdar the trail climbs along the east bank of the Jarsang Khola, then descends and crosses the stream on a wooden bridge at 4310m. Blue sheep, and even snow capped leopards, sometimes magically appears. The crow like bird choughs, large lamer geiers and Himalayan griffons circles you overhead. Overnight at Phedi. We take our next flight back to pokhara and spent a day here. You’re free here to feel the moderate climate and sceneries of this Magic land or Dream Land of Nepal. Explore the various interesting places like Mahendra Cave, David’s fall and the various lakes of course. You can buy some special souvenirs and enjoy the valley. Spend your night on the beautiful beaches. (You can stay longer for short tours such as drives at National parks, rafting, Tibet tours, mountain biking etc). Day 19: - Pokhara to Kathmandu, Take a 25 minutes flight or 6/7 hour Drive. All local transportation to and from the starting and ending points of the trek by Tourist bus/Private car/Van.